When a new player joins to play the game of craps he or she has lots of questions in mind. As a beginner to any game at online casinos players have certain doubts and need clarifications about the game as well as how to play and win. Here we are going to answer 12 most common questions that newbie players often ask when joining a craps table at any online casinos. Q1. 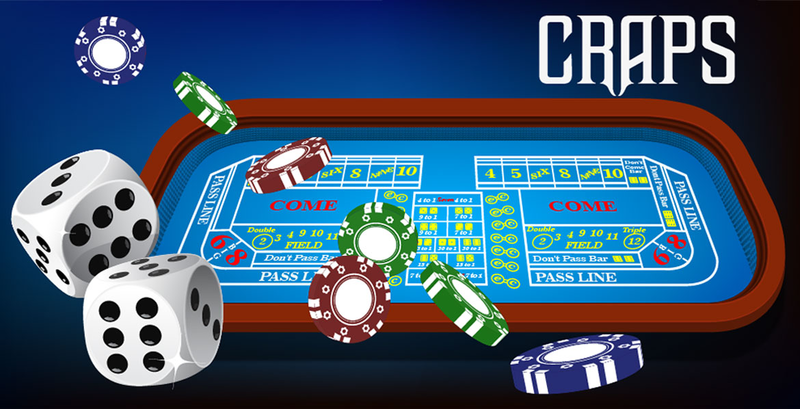 Can I play craps with real AUD at online casinos? Yes you can play craps with real AUD at Aussie friendly online casinos like Rich casino, Fair Go Casino, House of Jack Casino and various others. Also players can have a choice to play with Bitcoins at many reputed online casinos so currency is not much of an issue these days to play real money games. Q2. Can I play craps for free? Many online casinos offer free versions of their craps games so that you can learn the game and become comfortable with their software before actually playing the Craps for money. Also there are many social casino apps that offer free games of Craps to play. This is probably a great way to get your gaming experience, especially if you don’t have much experience playing craps online. However, in order to actually win real money, you have to play the real-money craps games. Q3. How do you bet in online craps games? To place your bet in craps game all you will you need to do is review the betting options and select one that suits your preferences. As a new player always place at least the minimum wager, usually $1 online, and roll the dice. The first two betting options you will have as the shooter will be the pass line and don’t pass line bet. These must be placed before the come out roll and pay even money when won. Q4. What is the Come bet? Q5. What are the payouts like in craps? Q6. Can I play craps without being the one to throw? When you play craps offline then you can play craps without being the one to throw but at online casinos you need to. In online craps the player is always the shooter. That is very advantageous in that shooting the dice is part of the fun of craps. Plus, in the online game you won’t have to worry about nerves, and shooting dice in front of a bunch of strangers who have bets placed on your throw. In a live casino, you never actually have to be the shooter, but really, the better question is why you wouldn’t want to roll the dice! Q7. What are the best bets to place in online craps? Q8. What are the odds of winning? Q9. Are online craps games rigged? The simple fact is that craps is a game of pure chance. There’s little you can do to affect the outcome of a roll, and just like in real life, online craps casinos do not have any influence over the dice either. To be sure you have a fair game, make sure you always play at a reputable online craps casino like the ones we list here for you. These selected casinos implement state of the art software with random number generators in addition to being certified and audited by the most respected organizations. Q10. How do I maximize my chances at an online craps table? The best way to win is to play smart. Make good betting decisions and make sure you know the rules of the specific craps casino you are playing at so you don’t make mistakes that will cost you your bet or potential winnings. As a general rule of thumb, ironically, the craps bets with the biggest payouts usually put you at the largest disadvantage. Q11. Where can I find a craps casino online? The first place you should look here to find the right casino for craps. All these casinos are tested for their secure, fair and responsible gaming. Also these casinos are legit Aussie friendly casinos with best craps game play, graphics, and payouts. You will find wonderful AUD bonuses as well as BTC bonuses here to grab as a new player to play the game of craps. Some of these regulated online casinos also offer no deposit bonus or minimum deposit of $5 -$10 to get started to play craps online. Q12. What is the difference between online or offline craps? Playing online craps is a fast gameplay. Online craps has an entirely different element to playing. It is faster than live games and will give you more control of little things like re betting, animations, and sounds. If you relish speed you can turn on the turbo option which skips the visualization of the dice roll and gets immediately into the revelation of the results. Also by playing online craps, you can make smaller bets often starting out a $1; whereas playing offline at land based casinos generally have a $5-$10 minimum. Also online the software keeps meticulous track of every bet which means you don’t have to keep count of exact units or worry about getting cheated by rounding on bets. Online craps table are relaxing as you can play wherenver and where ever you want with your mobile or PC. You can sit back, relax, look up bets on the fly, and never have to worry about the perfect craps performance. Also offline craps tables generally have a lengthy wait time for wannabe players. The best casinos online feature a number of craps tables that will gladly welcome you at any time of the day. Also the odds of winning at online casinos vary from one casino to another and you can easily check with their own odds and payout tables. ← How to play Craps with friends all free at Big Fish Casino?